Throughout 2017 Nokia remained loyal to the traditional 16:9 aspect ratio. Then, in 2018, the company openly embraced both 18:9 displays and notched panels. And today, with the unveiling of the Nokia X71 in Asia, the Finnish brand has adopted the next smartphone trend – display holes. Like many of the Nokia smartphones that precede it, up front the Nokia X71 sports both slim bezels and a slightly thicker chin. This is combined with a small camera cutout in the top-left corner (home to a 16-megapixel selfie snapper) and an in-ear speaker along the edge of the frame, thus removing the need for any kind of notch. 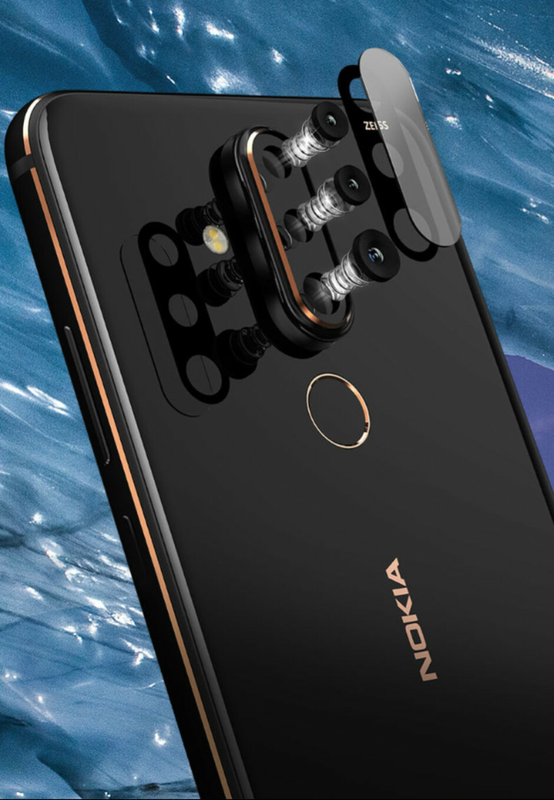 Turning the Nokia X71 over reveals a very familiar rear design that centers around the elongated vertical camera setup. This particular device doesn’t boast five individual cameras like the flagship Nokia 9 PureView, but it also doesn’t settle for the dual-camera setup so often seen on Nokia’s devices. In actual fact, it uses a versatile new ZEISS-branded triple-camera layout. 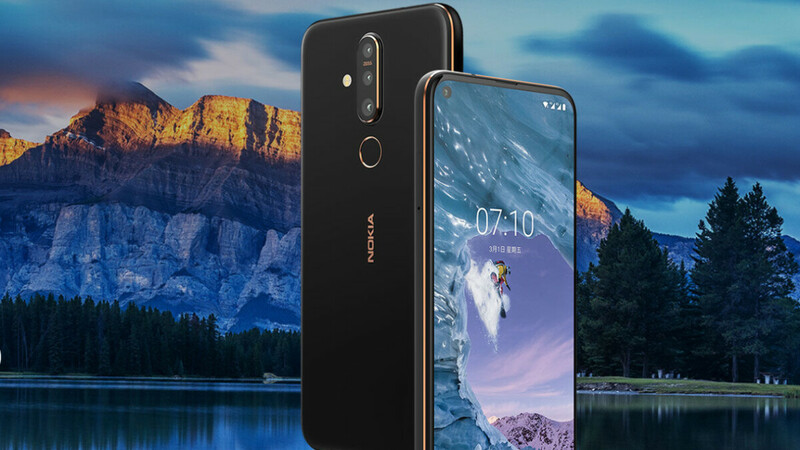 As its primary sensor, the Nokia X71 uses a new 48-megapixel camera which boasts an f/1.8 aperture. This is then paired with a separate 8-megapixel sensor coupled with a 120-degrees wide-angle lens. As an added bonus, the smartphone also features a dedicated 5-megapixel depth sensor which should help with bokeh imagery. Elsewhere on the smartphone’s rear, users can find a dual-tone LED flash and a traditional fingerprint scanner which sits directly below the cameras. Also present towards the center of the device is the Nokia branding. If we were to open up the Nokia X71 and check out its internals, perhaps the most prominent internal component would be the Snapdragon 660 that it carries. This chipset was previously used inside last year's Nokia 7 Plus and should provide relatively decent performance. It is, however, pretty old at this point – the Snapdragon 660 was first announced back in May of 2017 – so a newer chip would have been a welcomed addition. In any case, Nokia’s latest device also an impressive 6GB of RAM and 128GB of internal storage. If this isn’t enough, buyers can also expand it via the included microSD card slot. Other features on the Nokia X71 include Android 9 Pie, a 3,500mAh battery that supports 18W fast charging, a USB-C port, a 3.5mm headphone jack, and a unique LED notification light that is built into the power key. The Nokia X71 will be released on April 30th in a handful of Asian countries including Taiwan. In regards to pricing, the new smartphone is set to retail at TWD 11,900 in the market, which is equivalent to around $385/€345 at the current exchange rate. HMD Global – the company behind recent Nokia smartphones – is yet to announce any plans to launch the Nokia X71 internationally, but if it does the device will probably be marketed under a different name. Overall, the device resembles the upcoming Nokia 6.2 quite closely. The latter, however, is expected to ditch the added depth sensor found on the Nokia X71. The Nokia 6.2 is also expected to feature a slightly smaller 6.2-inch display and Qualcomm’s Snapdragon 632. These differences would suggest that the Nokia X71 will arrive internationally as either a variant of the Nokia 6.2 – Nokia 6.2 Plus – or as part of the Nokia 8 series, perhaps the Nokia 8.1 Plus. Ultimately, though, this is purely speculation at this point. It looks like a premium high end device, it's just a shame that it doesn't have a newer chipset. Looks stunning ! I just might consider a Chinese Nokia after all. What kind of backwards decisions did Nokia make in deciding which components go in which device. Some of this phone's hardware features should have been on the 9 Pureview. And why a pair a seemingly powerful 48mp camera with an older processor? Beyond me. I can forgive the older soc but price should be lower. The 48MP sensor is actually a mid-range sensor designed to look good on paper but that's all. It's pretty mediocre otherwise. And it doesn't easily allow OIS, it's just to boost sales for naive customers. I was thinking that too. That's just a little deceptive to me. I was wondering if high megapixel sensors were becoming cheap and of lesser value but most likely not on the same quality of lens that Huawei uses. It will be suicide for nokia x7 if priced at $385. I have nokia 7 plus, very good performance but in this oppo xiaomi age, nokia should give more competitive price for an older soc and ship to asian countries faster if they still want to exist. Fake news. It's just a Samsung S10e with a photoshopped back. /s G'Day! No SD670 especially or SD675 what a disappointment guess Nokia 8.1 remain only the choice with SD710 but it's price is higher than Poco F1 price range,hope Nokia update it chipset for international varient. I’m digging the design and everything about the Nokia X71....with the exception of the choice of SoC used. The use of the SD845 for the Nokia 9 Pureview was adequately and logically explained, but for the Nokia X71 to use the SD660 when the they could and should have gone the SD675 or SD710 route is beyond me. Not a wise move, HMD. Let’s see what this turns out to be internationally....hopefully an updated SoC, unless this turns out to be for the Nokia 6 range, then the use of this SoC would be at least understandable. So Nokia is gimping the phone because? If a much better SoC exists, which it does btw, why not use it? And when are we going to get a 7 Plus follow up or a release for the US where it can actually work on our carriers? It’s funny how you complain about this concerning OEM’s you don’t favor, but you’re on mute when your favored OEM’s do similar things. Why don't you put yourself on mute, and when have I ever said that I don't favor Nokia? Show me where I said so AND where I said I don't know what SoC the 7.1 uses. Oh you didn't think I forgot about that did you? Lmao your actions and commets on past Nokia related posts prove that you don’t favor Nokia. And I’m not that only one that’s pointed out your complaining for the sake of complaining. And I never said you didn’t know what SoC the 7.1 uses, so stop changing the facts to suit your false narrative. If I said it was the 7.1, post the link to the article where I said it. Don’t worry, I’ll wait....And it was the 6.1 that I said you didn’t know what SoC it used. We both know you said it. Didn’t think I’d forget that you didn’t know what SoC it used, did you? If I didn't favor Nokia, I would have never purchased the 6.1 or the 7.1. If you're talking about domfonusr who thinks I'm an Apple fan, then lol I shut him down with the facts and he's been quiet every since. Nice try though. You knew what was I was referring to despite the mishap, so don't try to act like it was totally off base. You made the claim, but you refuse to provide proof to back up your claim because you know it's a false narrative. Lmao no one believes you own a Nokia 7.1. You bash the company too much. You didn’t shut him down either, he just said his piece and chose to ignore an Apple fan who pretends not to be one, lol. You can’t even get straight what smartphone we were referring to, which proves that you don’t know Nokia branded Android smartphones, lol. Now post the link where I said it was the Nokia 7.1 as opposed to the Nokia 6.1 and stop deflecting. Don’t run from this, either. Post the proof, or you’re just changing the facts to suit your false narrative. I don't care if you believe me or not. I'm not going to lose any sleep over it. He said his piece and got verbally destroyed in the process. You can't even post the article that shows where I said or implied anything about not knowing what SoC the 6.1 used. Lmao of course you care. That's why you keep lying about it. He wrecked you with his piece and then ignored you and that got you triggered as well, which is why you're mentioning it now. You can't even post where I said you were talking about the 7.1 SoC as opposed to the 6.1 SoC. I already admitted that it was a slip up, but this just proves me right from something I said before about Nokia's convuluted naming method. Now post where I said anything about the SoC of the 6.1 where I didn't know what it was. Lmao the only reason why you admitted anything is because I caught you in your lie and called you out on it. Otherwise, you would have continued on with it. The naming scheme has nothing to do with it, you just thought I wouldn’t catch your lie, lol. Gee whiz, Venom (or should I say The_Miz or Mxy...), I wasn't even aware that you "shut [me] down." LOL! You mistook my silence for your own victory at some point. Not that I'm counting points or anything like that, you and MG are just hilarious to watch. As Colonel Rhodes (in Iron Man II) would say, it is a little like "watching two seals fight over a grape." I'm more of a blood thirsty shark. I aims to please, lol. But yes, he feels that if you ignore him, that means he “shut you down”. He hasn’t realized that most people just don’t want to waste time that they can’t get back since trying to talk to sense to him is akin to watching paint dry. Pot meet kettle because you just described yourself there. How many times have people tried to reason with you only for them to give up because you don't ever stop until you have the last say in everything? Negative. I described you to a “T”. Stop projecting. I verbally trashed you the last time you tried to accuse me of being someone else. I don't mind doing it again, but putting meanest in his place is cheap and easy laughs. You don’t “verbally thrash” anyone. We all know that you’re an undercover Apple fan that loves to troll, and I throughly putting you in your place. It hardly seemed like a real verbal "trashing," I have been through much worse elsewhere. I really could care less. I suppose that, if I didn't respond, you will think that you "verbally trashed" me again. It doesn't really matter to me, terribly, to be honest. I am responding to let you know that I have not ignored you, but that I have nothing meaningful to say that would really contribute to this conversation in a good way, and so I will just let it go at that. Have a nice weekend!